The next time you or someone you know picks up a cigarette, consider this: One of the many toxic by-products present in cigarette smoke is hydrogen cyanide, a colorless, poisonous gas that was used as a genocidal agent during World War II. It's not just smokers themselves who are at risk of the health hazards from this toxic chemical, but those around them as well. Hydrogen cyanide is primarily used in the manufacture of products such as paper, textiles, and plastics, as well as in pesticides to use to kill rodents. Cyanide can be found in nature as well. Peach pits, apple seeds, and some plants contain small amounts of cyanide. Hydrogen cyanide is one of the hundreds of chemicals found in cigarettes. For U.S. cigarette brands, the level of this chemical in inhaled mainstream smoke ranges from 0.6 percent to 27 percent. (Mainstream smoke is the smoke a smoker exhales after inhaling on the cigarette.) It is also present in secondhand smoke, so nonsmokers are also at risk of breathing in this poison when exposed to cigarette smoke. Although not classified as a carcinogen, hydrogen cyanide does cause other health problems that are just as detrimental to the health and overall well being of a person who smokes. 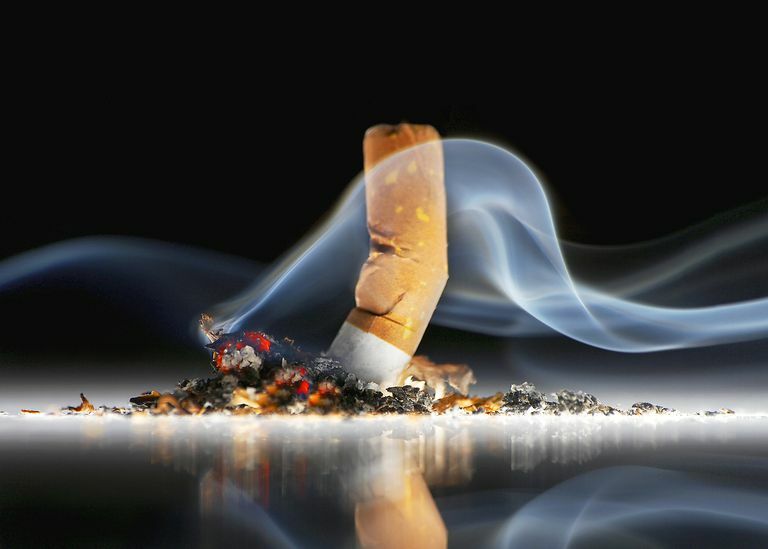 Long-term smokers may have a decreased lifespan of 10 to 15 years. In large concentrations, this poison will cause rapid death by asphyxiation due to its ability to block oxygen from the cells causing immediate suffocation. In cigarette smoke, the concentration of hydrogen cyanide is much smaller but it still contributes to a number of health problems TKTKmost commonly found in long term smokers or with those who work with this chemical in an industrial occupation. In small concentrations, the effects of hydrogen cyanide exposure can lead to problems of the central nervous system. These problems include muscle weakness, headaches, dizziness, and vomiting. Long term smokers and industrial workers will usually also exhibit heart palpitations and sleep apnea, gasping, shortness of breath, tremors, fainting, and thyroid problems. Thyroid problems caused by hydrogen cyanide exposure include the inability of the thyroid gland to properly absorb iodine. While small amounts of hydrogen cyanide will not cause immediate death, smokers are very slowly poisoning themselves with hydrogen cyanide with every puff of a cigarette. Generally, the more serious the exposure, the more severe the symptoms. Similar symptoms may be produced when solutions of cyanide are ingested or come in contact with the skin. Treatment for hydrogen cyanide poisoning includes breathing pure oxygen, and in the case of serious symptoms, treatment with specific cyanide antidotes. People with serious symptoms will need to be hospitalized. Continuing to smoke cigarettes even after learning about what exactly is present in the smoke that is being continuously inhaled is, unfortunately, a personal decision that has to be made by the smoker themselves. Centers for Disease Control. Facts About Cyanide. Chronic Toxicity Summary for Hydrogen Cyanide. California Office of Environmental Health Hazard Assessment.